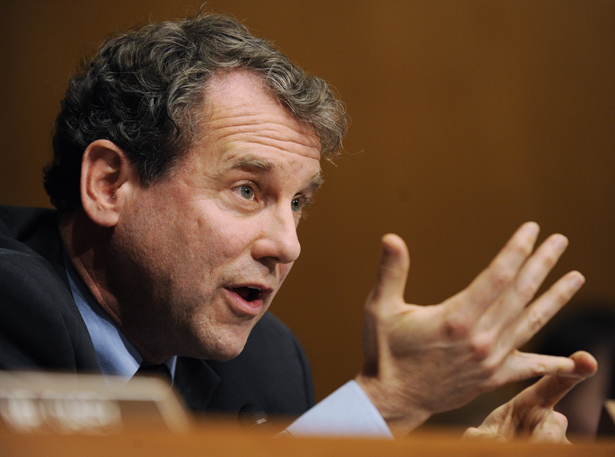 What if Sherrod Brown, Battler Against ‘Too-Big-to-Fail’ Banks, Gets Banking Committee Chair? The progressive populist senator from Ohio would hold big banks to account -- a new concept for Washington. Now, as the US Senate looks to reshuffle its most powerful posts following the 2014 election, Brown is a serious contender to take over as chair of the Senate Banking Committee. That’s a very big deal, as Brown is not merely an outspoken critic of oversized banks. The Ohio Democrat has built bipartisan support for break-up-the-banks legislation, and he has a populist eye for issues that highlight the struggle to end the excesses of Wall Street and the banks. Just last week, he secured a unanimous Senate vote for a resolution to end federal subsidies for the biggest banks. So how could Brown, who is just starting his second term, become chairman of the powerful Banking Committee? The current chair, South Dakota Democrat Tim Johnson, will retire after the 2014 election. That puts Senator Jack Reed, D-Rhode Island, in line to chair the committee; but Reed is also in line to chair the powerful Armed Services Committee, and it is widely believed he prefers that position. Next in line is New York’s Chuck Schumer. But Schumer hopes to eventually replace Senate Majority Leader Harry Reid, D-Nevada. And that makes his decision complicated. Because Schumer is broadly seen as being close to Wall Street, the big bankers would love to see the New Yorker take the committee chairmanship. And he may well do so—if only to block Brown. But Schumer is savvy enough to know that doing so could damage his long-term prospects as a contender for a leadership post. Why? Because the Senate’s burgeoning progressive caucus—which will be a factor in any leadership race—wants to get tougher with the banks. And because a stint as Banking Committee chair, especially if it is characterized by compromises with the industry’s biggest players, could tarnish Schumer’s image and make him a less attractive leadership prospect. New Jersey‘s Bob Menendez, the third Democratic senator in line for the Banking Committee chairmanship, has given every indication that he is more interested in remaining chair of the Foreign Relations Committee—a post he took up when former Massachusetts Senator John Kerry became Secretary of State. That brings us to Brown. To be clear, Brown is not a critic of all banks. Just the behemoths that could, were they to stumble, crash the US economy. Brown talks up community banks and credit unions that play by the rules and serve consumers. Indeed, he wants to make sure that the federal government respects small banks, rather than simply bowing before the big guys. While many other Democrats have been willing to compromise on the “too-big-to-fail” issue, Brown has been steadfast. When the Senate was debating what would eventually become the Dodd-Frank financial reform law, Brown broke with his fellow Democrats and sought to enact the Safe, Accountable, Fair & Efficient (SAFE) Banking Act. That measure would have capped the size of banks so that none could control so large a percentage of the economy that the threat of its failure might demand a new bailout. Brown was blocked then, but he’s back with a new version of the bill, and with a Republican co-sponsor, Louisiana Senator David Vitter. It’s been a long time since the Senate Banking Committee was chaired by a progressive populist who is willing to take on not just “too-big-to-fail” banks but to demand that the banking industry serve communities and treat consumers fairly. And it’s been even longer since a populist chairman had an ally on the committee like newly-elected Massachusetts Senator Elizabeth Warren, a key ally of Brown’s. History does record, however, that big things happen when the oversight responsibility is handed to a senator who worries more about Maine Street than Wall Street. When Democrats gained control of the Senate in 1933, Florida Senator Duncan Upshaw Fletcher took the chairmanship of what was then the Banking and Currency Committee. Charged with identifying the guilty men whose greed caused the 1929 Wall Street Crash, and the Great Depression that followed, Fletcher worked with a crack New York prosecutor, Ferdinand Pecora, to call the bankers and the speculators to account. Pecora and his team were so aggressive, and so effective, that they even got J.P. Morgan Jr., to acknowledge that he had paid no income tax in 1931 and 1932—an admission that provoked a national outcry and demand for reform. The reforms came quickly. The Banking Committee’s high-profile inquiry cleared the way for the enactment of the Glass-Steagall Banking Act of 1933, the Securities Act of 1933 and the Securities Exchange Act of 1934. The Securities and Exchange Commission was established in 1935 to enforce those new laws, along with a host of other measures that end myriad abuses. The combination of Fletcher Duncan and Ferdinand Pecora put the people back in charge in the 1930s, and provided generations of Americans with protection against the threat posed by unregulated and under-regulated banks and brokers. The combination of Sherrod Brown and Elizabeth Warren could do the same in the twenty-first century. That prospect scares behemoth bankers. But it should excite Americans who recognize that the nation’s economy—and its democracy—will never be secure for so long as “too-big-to-fail” banks are allowed to call the shots. What happens when you rip a hole in the safety net? Read Bryce Covert’s analysis.